Larry Sultan, Antioch Creek, 2008. Courtesy The Estate of Larry Sultan and Casemore Kirkeby. I never had the chance to meet Larry Sultan. I watch old interviews, read his words, and listen to those who knew him. I have been working for the past year and a half with curator emerita Sandra Phillips on bringing his retrospective to SFMOMA, and have spent a lot of time with his photographs and thoughts. But sometimes I feel like an impostor, an outsider. I wasn’t there when he mused about art and life with his students. I don’t know what it was to watch him move through a room. People speak of Larry’s generosity and warmth, his remarkable magnetism and charisma. The experience of arguing with him, laughing with him, loving him. He was so open and articulate with everyone, so real — this mysterious figure who hovers in and out of my awareness, just beyond my reach. So I look to his work in order to find him, particularly the last series of photographs he made before his death in 2009. Homeland (2006–9) is comprised of painterly, sublime pictures depicting Latino day laborers he hired and posed in different areas of the Northern California suburbs, often at the borders of tract housing or the edges of the landscape — a culmination of his interests in home, displacement, and ambiguity. The images are melancholic, unsettling, and beautiful in what they say about immigration, class, and community. They are also poignant emblems of Larry’s commitment to interrogating the tenuous space between the theater of reality and the illusory conditions that punctuate it. One work in particular stirs me in ways that I am still trying to resolve. 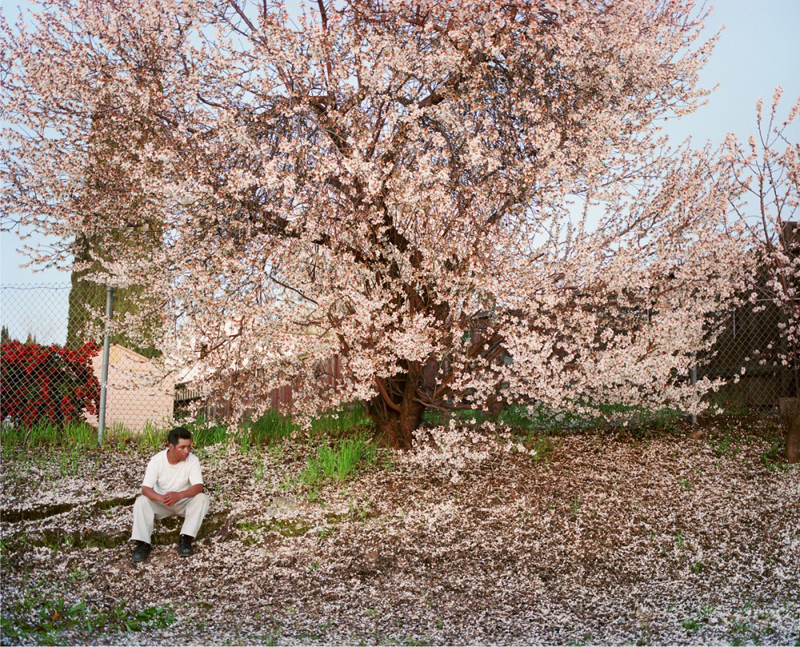 Antioch Creek (2008) features a man dressed in white sitting beside a blossoming plum tree with a chain link fence in the background. The tree sways and swells before me, blossoms floating in the wind and falling to the ground, creating a dramatic mirroring effect. I may need to sweep them off the floor of the gallery when the photograph is hung on the wall. I find out from Larry’s former student and studio assistant Dru Donovan that he almost always took advantage of natural light for this Homeland series; however, for Antioch Creek he used a small flash. That is part of what makes it sizzle and gleam. He wanted to activate this tree even more, give it a charge and make it mystical even as he captured the genuine abundance and grandeur of the California terrain. The more time I spend with Antioch Creek, the more I recognize my vulnerability. The photograph deals in loss and rebirth, a stunning cycle of life in one picture. Last year, I suffered a personal loss so devastating and raw I thought I would never recover. Trying to cope, I immersed myself in the planning for this exhibition, turning to Larry’s photographs partly for distraction, partly for healing. This photograph with all of its magical properties helped me grieve while also locating another point of attachment with Larry. I imagine him, as I did, using it to meditate on and channel feelings of hope, uncertainty, solitude. I live about fifteen minutes away from this particular Antioch suburb, in the Concord area. I was taking a walk with my husband one Sunday afternoon in February and we came across a blossoming tree that looked achingly close to Larry’s tree. I stared at it, felt its branches, got lost in the blooms and the warm sunlight that danced around them. It seemed for a moment like a dream, with Larry standing next to me. Later in his “10×4” talk, Robert Mailer Anderson remarked: “He gave us all the light back that we needed to see ourselves.” I think about all that Larry has given me, and I am grateful and honored to have been involved with this exhibition. Larry once stated that photography stops time: “It’s an exterior form of memory — this existed… its greatest truth is to leave a trace of what has been.” These traces are what I hold. This is the Larry I know. That made me cry. I worked with Larry years ago, and am honored to have installed this show with you, Sandra and Kelly. You made me think differently of this last series, thank you.